Please support The Lapworth Museum, now! Members will be familiar with the support and hard work Roy Starkey has contributed to the transformation of The Lapworth Museum at Edgbaston, Birmingham. Roy would also like to share this great news about the museum and seek your support following the museum’s shortlisting for Art Fund Museum of the Year 2017, along with Tate Modern, The Hepworth Wakefield, Sir John Soane’s Museum, and The National Heritage Centre for Horseracing & Sporting Art. Representatives from the Museum attended the event at the British Museum last night, when the shortlist was announced live on the BBC Radio4 Front Row programme. There was immediate press coverage and lots of mentions of David vs Goliath particularly in connection with Lapworth – Tate Modern. Several of the broadsheets and the BBC already have write-ups of the shortlist. The Telegraph and the FT and particularly The Guardian and BBC all have good coverage. There will be more coverage over the weekend, including on BBC Breakfast this morning and then a double-page feature on the shortlist in The Guardian on Saturday. 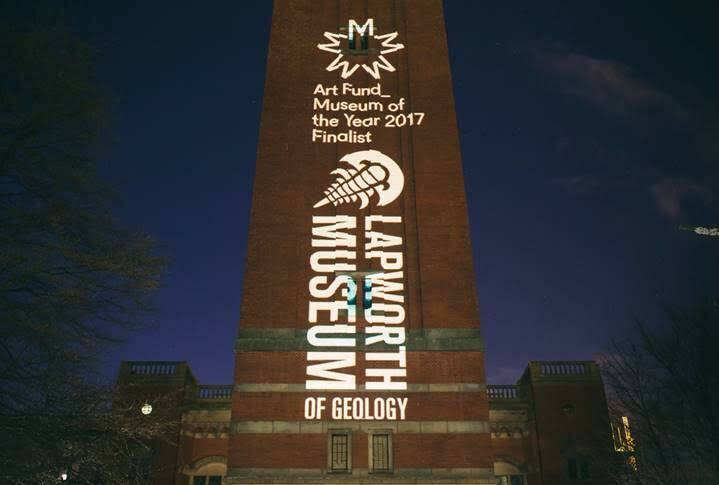 In addition to the press release and social media activity, the clock tower was lit up with the Lapworth and Art Fund logos between 9pm and 10pm last night. You can see a short video from YouTube featuring the finalists here. 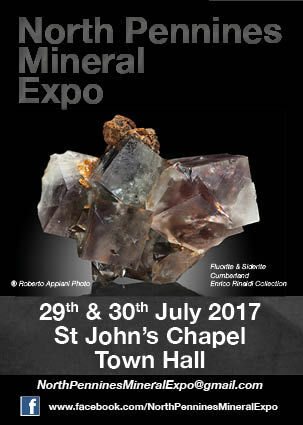 You can also help to promote the museum on social media in the run-up to the final decision through the Art Fund website here. 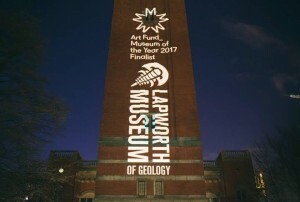 If you do so, please tag both Art Fund (@artfund) and Lapworth Museum (@LapworthMuseum) and use the hashtags #museumoftheyear and #lapworthrocks. The Art Fund will be offering a weekly prize of a National Art Pass and a museum goody bag for their favourite post (across all five museums). 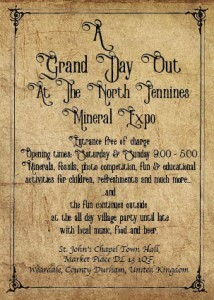 The Lapworth will also award a prize to a favourite post each week. Even if you are not personally active on social media, please spread the word to your friends and contacts / Societies, and ask them to get involved. Thanks for your support – fingers crossed for a good result! 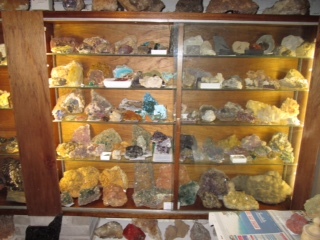 The Lapworth Museum website can be found though this link here.